Last week I was in Delray Beach, Florida, where I’ve been twice before for the annual Copywriters Bootcamp sponsored by American Writers & Artists, Inc. (AWAI) While the food is always wonderful, there was one occasion where I left to find some. You see, it was my birthday, and after one of the presentations, everyone scattered. I decided I would have a great lunch and some great dessert. (Boy, did I.) I’m getting ahead of myself. Let’s start at the beginning. . . .
On prior trips out of the conference, I walked past Boheme Bistro a few times, but kept going because I thought it might be too expensive. During the first two trips, I was on a company expense account. Anything unusual could be considered fraudulent, or at least raise an eyebrow. Since my manager was so nice to send me, I made absolutely certain that there was nothing unusual about my credit card receipts. The conference started at 1:00 pm Wednesday with a luncheon, so that morning, I decided I’d do my souvenir shopping. (You just can’t go wrong with a) coffee cups, b) T-shirts, and c) fridge magnets. I love them all.) Great little walk up and down Atlantic Avenue, but about 11:00 am, I started getting hungry. REALLY hungry. I went into a hotel about six blocks from the beach and was curtly told by someone at 11:10 am in the snack bar that breakfast was over promptly at 11:00 am. I said, just as curtly, “Thank you” and walked out. I went past the Boheme, thinking they would tell me the same thing, but turned around when I saw a bakery sign. I asked the lady about breakfast, and she invited me in. (It was now about 11:15.) I didn’t want to look at a menu, take a table, I really just wanted some food. (At this point, I almost didn’t care what it cost, since it was my own credit card being used.) She suggested what they call “Grandmother’s Style Eggs.” I said, “OK.” I had a seat at the bar and they brought me a glass of water. I waited patiently. A little longer than fast food, but not very long. You can’t rush these things. What they brought was the kind of picture-perfect dish you see in magazines–which I forgot to take a picture of, because I was THAT hungry. In addition to three scrambled eggs with chopped tomatoes and onions, there were what they call “home potatoes.” I normally don’t eat potatoes, (high in starch) but I couldn’t resist these. I would ignore chocolate for these potatoes. Red (aka “new”) potatoes, perfectly cut into a very large dice, and fried up with the crispiest outsides ever. They offered me ketchup, but I declined. It would have ruined these potatoes. All they needed was salt. Trust me when I tell you I was the happiest cat in the kingdom at this point. I finished off this delicious creation and paid my tab. 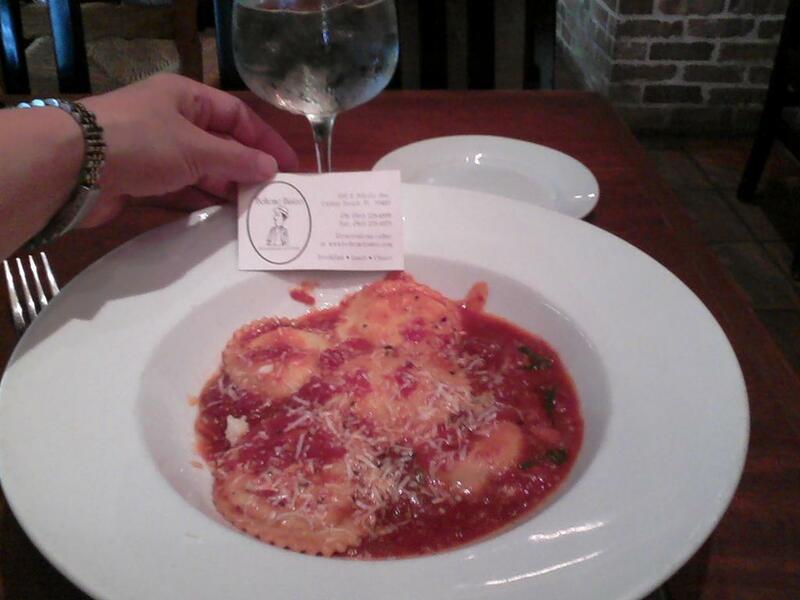 I wanted to go back to the Boheme before I left Delray Beach, and on Friday, I got my chance. Friday, October 26th. My birthday. Everyone sort of scattered after the session I was in ended, so I went off on my own to the Boheme. Why? Partly because I knew they wouldn’t do that embarrassing birthday thing they do in chain restaurants. I hate that. Happy Birthday. . .to me!! I know I shouldn’t have–I really shouldn’t have–but I asked about dessert. Since it was so early in the day, all the desserts were in a small fridge case in the back. 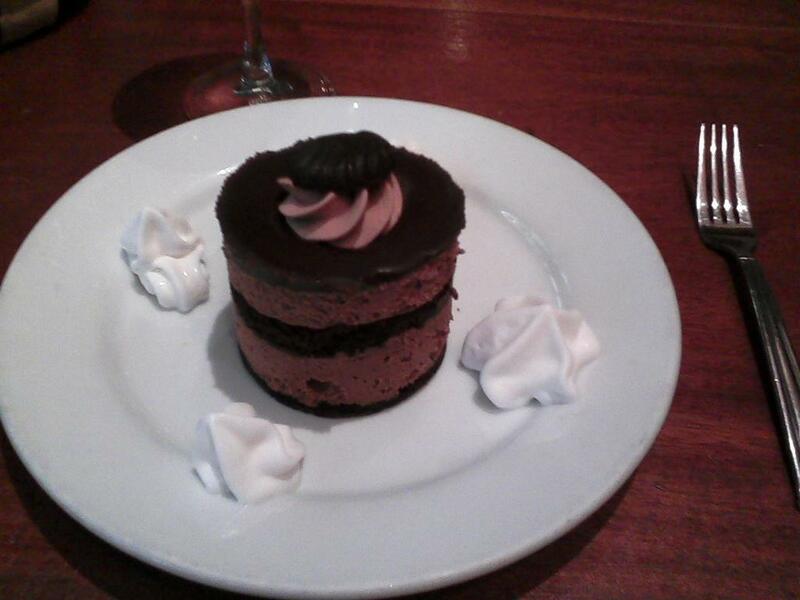 So I looked at all of them (from a distance) and decided to have that chocolate mousse-y thing. The nice waitress had to take the plastic off the sides. Yes, it was delicious. No, I did not share. Yes, I ate the whole thing. No, I did not lick the plate (but was greatly tempted.) Yes, it was worth the calories. The little whipped cream stars were a nice touch. The place is a comfortable, rustic building, with indoor and outdoor seating, and a nice big bar, complete with a huge selection of wines and liquors. (No, not at 11:30 am.) It’s comfortable, with a friendly staff who will tell you anything you want to know. The kind of place you wander into like I did for a bite to eat and maybe a drink. Highly recommended, and I can’t wait to go back. Thanks!! !